HDD Deal of the Day: 'Farscape: The Compete Series' Blu-ray $68.99 at Amazon! Save sixty-five percent on the box set of all four seasons of the cult sci-fi series on Blu-ray! Amazon is currently offering 'Farscape: The Compete Series' for $68.99 (65% off suggested list price). An imaginative fusion of live action, state-of-the-art puppetry, prosthetics and CGI, "Farscape," produced by The Jim Henson Company in association with RHI Entertainment, featured mind-boggling alien life forms, dazzling special effects, edge-of-your-seat thrills, irreverent humor and unforgettable characters...all brought to rich life by the creative minds at Jim Henson's Creature Shop. Strap in and hold on tight for the extraordinary adventures of astronaut John Crichton, (Ben Browder) who, after a freak accident, finds himself surrounded by hostile aliens and soaring through the cosmos aboard Moya, a glorious living space ship. Hunted by the relentless Peacekeepers, he allies himself with Moya's crew - Aeryn Sun (Claudia Black), Luxan warrior Ka D'Argo (Anthony Simcoe), azure priestess Zhaan (Virginia Hey), spritely Nebari thief Chiana (Gigi Edgley), Dominar Rygel, the deposed royal ruler of the Hynerian Empire and Pilot - to search for a way out of this inconceivably alien world and return home. A+E Networks Home Entertainment, one of the pioneers of TV DVD collectibles, and The Jim Henson Company have worked closely together to guarantee that this BLU-RAY EDITION will satisfy the series loyal fan base. 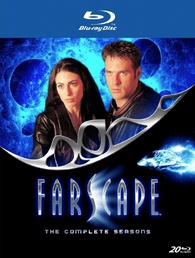 "With FARSCAPE, we work hard to meet our fans' high expectations and this new Blu Ray release utilizes the highest quality source materials available so I know our audience will not be disappointed," said Brian Henson, Chairman of The Jim Henson Company and executive producer of FARSCAPE. "A+E Networks Home Entertainment has met all the challenges that, given the nature and age of the series, are inherent with a show like FARSCAPE, and the result is that all four seasons of FARSCAPE look better than ever before." The superb High-Def picture and sound isn't the only cause for celebration as this set also includes a BRAND-NEW documentary: Memories of Moya: An Epic Journey Explored featuring revealing new interviews with creators Brian Henson and Rockne O'Bannon, writer Richard Manning, and stars Ben Browder and Claudia Black as they look back at the legacy of the sci-fi classic. Click here to take advantage of this great deal and remember it only lasts until tomorrow!